Unknown -- Listed under Pennsylvania on DPMOs paperwork. Source: Compiled by Homecoming II Project 01 September 1990 from one or more of the following: raw data from U.S. Government agency sources, correspondence with POW/MIA families, published sources, interviews. During the 1950's, the deteriorating political situation in Laos allowed the North Vietnamese Army and Pathet Lao guerrillas to seize the Laotian panhandle from the Royal Lao Army. Even though the Geneva Accords restricted a large military presence in Laos, in 1958 the US established a "Program Evaluation Office" (PEO) as a CIA cover for anti-Communist covert operations. One of its first programs utilized Hmong tribesmen for a pilot guerrilla program. It soon became the largest clandestine army in CIA's history. Using US Special Forces as PEO "civilians," a few CIA officers and 90 elite Thai Border guards, an army of some 9,000 Hmong was trained. Within 10 years, the Hmong army grew to a force of over 40,000 guerrillas and became the most effective fighting force in Laos. Air America, the CIA's covert airlines, supported the Hmong as well as other agency-backed clandestine troops. As the war escalated throughout Southeast Asia, the growing US military presence guaranteed that Air America could operate in relative obscurity. Likewise, with little fanfare throughout the war, Air America fought in the frontlines of the unconventional war with very little attention paid to it. It's aircrews flew "black missions" over China, North Vietnam and the Laotian panhandle and flew every type of aircraft from 727 jets to small Cessna's. 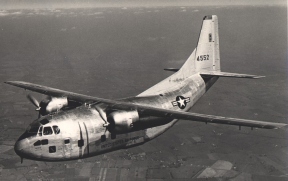 Frequently using an aging fleet of World War II twin-engine C123 aircraft, it transported everything from combat troops (alive, wounded or dead) to baby chicks, while supplying refugees and specially trained Chinese Nung trailwatchers operating in areas denied to US military personnel, with whatever was needed. Additionally, Air America contracted with both the US Drug Enforcement Agency to track international drug smugglers while at the same time it hauled the Hmong's valuable annual opium crop from where it was harvested to where it was to be processed. As US forces pulled out of Southeast Asia and the communists drove the Guerrillas from their homeland, Air America personnel picked up the slack by hauling and feeding tens of thousands of refugees. Though it had been declared obsolete in 1956, the Fairchild C123 Provider, which was a converted WWII glider, became one of the mainstays of tactical airlift in the Vietnam War. In 1962 the Provider was fitted with special equipment to spray defoliants. Later, it was modified with a pair of J-85 jet engines that increased its payload carrying capability by nearly one third. The first of these modified C123s arrived at Tan Son Nhut on 25 April 1967, and this venerable old aircraft proved to be among the hardest working aircraft throughout Southeast Asia. On 27 December 1971, Captain George Ritter, pilot; Captain Roy F. Townley, co-pilot; Edward Weissenback, kicker; and Khamphanh Saysongkham, kicker; comprised the crew of an Air America C123K (tail #6293), Flight #293. In the early morning the crew of three Americans and one Lao national departed Vientiane, Laos and flew to Udorn Airbase, Thailand to obtain their cargo of rice and other supplies that was bound for Royal Lao Army troops stationed at the village of Ban Xieng Lom, Luang Prabang Province, Laos. Once the cargo was loaded onboard the Provider, Capt. Ritter took off from Udorn on the resupply mission. The Provider's flight path was from Udorn Airbase, Thailand to Lima Site (LS) 69A, which was also located at Ban Xieng Lom. The flight was to make course changes over Lima Site (LS) 23 located at Sayaboury, Laos; then a second change over LS 62A located at Ban Hong Sa, Laos before continuing on to LS 69A. The aircrew made standard radio checks at the same time they made course changes. The last communication with flight #293 was when the aircrew made a radio transmission when they were over Ban Hong Sa. They were to land at Ban Xieng Lom 11 minutes later. When the C123K failed to arrive at its destination, an extensive search and rescue (SAR) operation was initiated and continued over the next several days. When no trace of the aircraft or its crew was found, the search was terminated and Roy Townley, George Ritter, Edward Weissenback and Khamphanh Saysongkham were listed Missing in Action. A radio transmission made by a Pathet Lao (PL) unit was intercepted by US intelligence in August 1972 that provided information about the fate of the Air America aircrew. The communist transmission stated that in late December 1971 an American aircraft was shot down and all of the Americans captured. This report was correlated to Air America flight #293 and copies of it were placed in George Ritter's, Roy Townley's and Edward Weissenback's casualty files. In October 1972, another intelligence report, IR 2 237 0095 72, stated, "Source allegedly observed the crash of an aircraft with the tail #293 in the vicinity of Muong Sai airfield (RC123893) in December 1971. According to the source, three Americans and one Lao who had been aboard the aircraft were captured and later taken to a detention facility in the vicinity of UG425730. Source further stated that the Americans were taken out of the detention facility in June 1972 and transferred to North Vietnam." The source elaborated on the condition of each of the men: "The pilot of the aircraft suffered a broken left arm. Otherwise he was in excellent condition. The co-pilot suffered an unknown injury to the knee. Otherwise he was in excellent condition. The American kicker suffered an injury over the left eye. Otherwise he was in excellent condition. The Lao kicker, named K, lost one tooth. Otherwise he was in excellent condition." The source described the detention facility and the daily activities of the American POWs as follows: "The detention facility was reportedly located inside a cave which had a five to six meter-high waterfall running over the entrance of the cave. Two cells were inside the cave. One cell was for US POWs and the other was for the high ranking Thai and Lao personnel. Outside the cave were areas for growing vegetables including an area for growing pumpkins. Approximately 50 enemy personnel reportedly consisting of PL were within one kilometer of the camp. The Americans reportedly bathed in a nearby stream once a week, cut fire wood in the vicinity of UG423740, and were also utilized to grow vegetables." In August 1973 a defector, who was a Pathet Lao General, provided information regarding American POWs he had personal knowledge about. The General was shown pictures of American POW/MIAs in an effort to identify those Americans he saw in captivity. He positively identified photos of Roy Townley and Edward Weissenback as being two of the prisoners he had seen. He was not able to provide information about George Ritter and Khamphanh Saysongkham. In 1974, while reviewing a book containing photos of unidentified Prisoners of War, Roy Townley's eldest daughter found a picture that she believed was her father. The picture, simply identified as "Photo #109," depicted an American POW lying in a hospital bed with a broken left arm bandaged in a splint. According to US intelligence personnel, the picture was taken prior to October 1972. In time the Townley family sent several pictures of Roy Townley to the State Department's casualty office requesting to have a comparative analysis done between them and Photo #109. Over the next several years more than one analysis of the photographs was conducted. The various comparison reports concluded "that both men had several facial features that were similar (facial structure, hairline, nose, ears, etc. ), but that this was considered inconclusive," and therefore, they could not say if the picture was of Roy Townley or not. In the summer of 1983, Capt. Townley's daughters met with Admiral Paulson, the Director of the Defense Intelligence Agency (DIA), to discuss their father's case, Photo #109 and their belief it was their father. During this meeting, Admiral Paulson told them, "I believe it's your father (the man in the photo); everybody I show the pictures to believes it's your father." Additionally, Admiral Paulson showed them infrared photos of the man in Photo #109 and matched it with the pre-capture photo of Capt. Townley lying in a similar position. The photos showed two moles on the mouth area that identically matches those of Roy Townley. In 1992, a National Security Agency (NSA) correlation study of all communist radio intercepts pertaining to missing Americans, which was presented to the Senate Select Committee on POW/MIA Affairs in a classified format, was finally declassified and made public. According to this document, at least 1 Pathet Lao radio message was intercepted and correlated to this incident. The NSA synopsis states: "Unidentified anti-aircraft units … the cumulative total of five aircraft shot down on 27 December 71, in the northern regions next to the provinces of Quang Vinh, Thanh Hoa, Nghe An, and at least two pilots were captured alive." George Ritter, Roy Townley and Edward Weissenback are among the nearly 600 Americans who disappeared in Laos. Many of these men were known to be alive on the ground. The Laotians admitted holding "tens of tens" of American Prisoners of War, but these men were never negotiated for either by direct negotiation between our countries or through the Paris Peace Accords which ended the war in Vietnam since Laos was not a party to that agreement. If Roy Townley, George Ritter and Edward Weissenback died in the loss of their aircraft, each man has the right to have his remains returned to his family, friends and country. However, if they survived as is indicated by US intelligence and at least one post-capture photograph, then their fate, like that of other Americans who remain unaccounted for in Southeast Asia, could be quite different. Either way there is little doubt the Lao know what happened to this aircrew and could return these men or their remains any time they had the desire to do so. American civilian aircrews, like their military counterparts in Vietnam and Laos, were called upon to fly in many dangerous circumstances, and they were prepared to be wounded, killed or captured. It probably never occurred to them that they could be abandoned by the country they so proudly served. Click Here to view a queried report of messages and files concerning Mr. Ritter from the POW/MIA Database at the Library of Congress's Federal Research Division. (Links will open in New Browser Window). You can run queries on various name spellings to view the messages. Did you serve with this HERO? Is he Family, an old friend, or a High School Sweetheart? Is there something special you would like to share about Mr. Ritter -- If so, I would like to hear about it and post it on this page! !